The Windows XP and Windows Vista operating systems also had the video editing software onboard, but it wasn’t included in more recent versions of Windows, such as the ever so popular Windows 7, Windows 8 or the latest Windows 10 as standalone software. Instead, the Windows Movie Maker software was included in the Windows Live Essentials suite. During 2012, Microsoft discontinued the use of “Windows Live” anything. That included the popular instant messaging application that was used right around the world by millions or teens and young adults at the time, plus the Windows Movie Maker. Many didn’t understand the move to discontinue Windows Live Mail and the instant messenger service that went along with it, especially since it was never replaced with anything. Although, it might have had something to do with Microsoft’s Skype acquisition which happened during 2011. Skype, at the time, seemed like it was worth $8.5 billion dollars for Microsoft Corp (that’s what they paid for it), but it never took off as a place for Windows users to chat. Also, it isn’t really used that much for video calling either—or at least not enough to justify the price they paid for it. Perhaps with the rise of plenty of other services all offering ways for people to video call for free, like most instant messenger applications such as WhatsApp, Line, etc. are to blame. But the statistics for Skype usage and generally inflated due to Skype being a native installation whenever someone buys Windows. 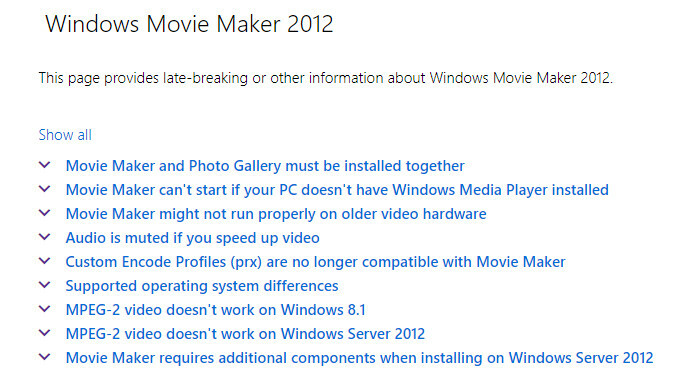 On top of everything, Microsoft hasn’t given any indications that they are planning a return of the Windows Movie Maker to be included by default in future software updates rolling out to Windows 10, or in any future Windows operating system versions in general. 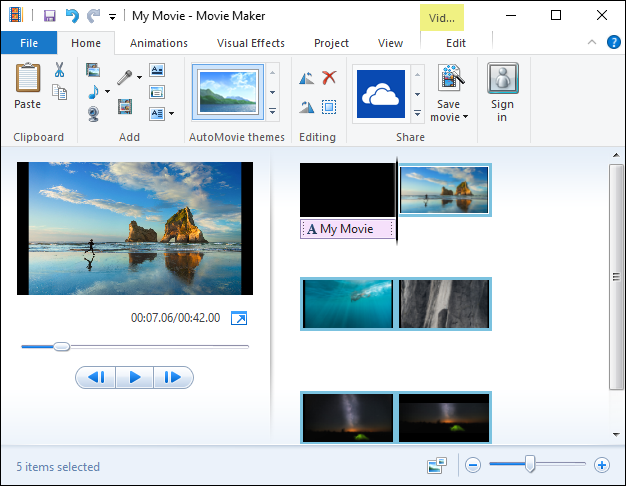 As long as you have updated from Windows 7 or Windows 8/81 to Windows 10, though, there is a tool you can use to have the Windows Movie Maker program installed on your computer. Likewise, it’s also possible to install the Windows Live Mail if you preferred having that graphical interface on your computer also. Visit the Windows Essentials 2012 page from Microsoft to download the web setup file. To find the files that are related to the Movie Maker, you need to scroll down the page until you see the “Windows Movie Maker 2012” heading. (You don’t need to worry about finding the right setup file relating to architecture on the computer; i.e. the setup file works on both the 64-bit and the 32-bit processor versions). Once the file is downloaded, open it up and click on the “Choose the programs you want to install” option from the menu. It’s here where you need to uncheck all of the boxes that you don’t want to have installed along with the Movie Maker software. For example, if you only want the Windows Movie Maker, then deselect each box that does not say Windows Movie Maker next to it. The Windows Essentials 2012 file is no longer available to download from Microsoft. The Redmond company has officially ended its support. If you have it installed on your computer already, it is possible (and fine) to continue using it. All components of what made up the Windows Essentials—including the Movie Maker, OneDrive, Photo Gallery, Windows Live Mail, Live Writer and Family Safety — are all no longer available. As mentioned, the Windows Essentials can still be used. The difference is Microsoft has taken the installer away so it can no longer be downloaded and you won’t be getting any more software updates in the future if you do have a computer that has it installed already. Software updates are usually required to add functionality and not just features eventually, so the Windows Essentials package will ultimately need to replace by yourself in favor of something else. But for the time being, and probably the next few years, it—and all of its features—are still perfectly fine to use. The support for Windows Essentials 2012 ended on the 10th of January 2017. There was an offline installer that people were installing since that date, but the offline installer is now gone too. There are some alternatives out there for people to try that offer a similar experience to the Movie Maker software. One of them is called Ezvid; it comes with its own official website that you can check out. The other software you might want to get to know is Davinci Resolve—both because it’s free to use and it is great software.